Cardamom oil is extracted from Elettaria cardomomum (also known as Elettaria cardomomum var. cardomomum) of the Zingiberaceae family and is also known as cardamomi, cardomum and mysore cardomom. Cardamom oil is sweet, spicy and almost balsamic in fragrance, is clear to pale yellow in color and slightly watery in viscosity. A perennial, reed-like herb, Cardamom grows wild and is cultivated in India and Ceylon. It grows up to 4 meters (13 feet) high and has long, green silky blades, small yellowy flowers with a violet tip and a large fleshy rhizome, similar to ginger. Oblong gray fruits follow the flowers, each containing many seeds. Cardamom was well known in ancient times and the Egyptians used it in perfumes and incense and chewed it to whiten their teeth, while the Romans used it for their stomachs when they over-indulged. The essential oil of Cardamom is extracted by steam distillation from the seeds of the fruit gathered just before they are ripe. The yield is 1-5 %. The main chemical components of cardamom oil are a-pinene, b-pinene, sabinene, myrcene, a-phellandrene, limonene, 1,8-cineole, y-terpinene, p-cymene, terpinolene, linalool, linalyl acetate, terpinen-4-oil, a-terpineol, a-terpineol acetate, citronellol, nerol, geraniol, methyl eugenol and trans-nerolidol. 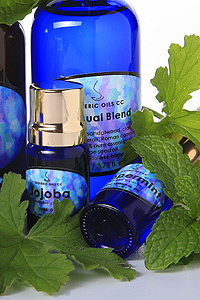 Cardamom oil is non-toxic and non-irritant as well as non-sensitizing. Cardamom oil is particularly helpful for the digestive system. It works as a laxative and soothes colic, wind, dyspepsia and nausea - even nausea in pregnancy. It warms the stomach and helps with heartburn. When feeling weak and mentally fatigued, cardamom oil can help with its refreshing and uplifting effect. Cardamom oils' expectorant properties help clear coughs. It is a well-known remedy for impotence and low sexual response. Cardamom oil is most beneficial to the digestive system, but can also help with the treatment of coughs, and a general feeling of not feeling that well. As a massage oil or diluted in the bath, cardamom oil can assist with digestive system, coughs and be used as a general tonic. It is excellent in the bath, leaving you feeling refreshed and stimulated. It blends well with rose, orange, bergamot, cinnamon, cloves, caraway and cedarwood.